75 degrees, a sunset ceremony tucked away in the hills, and the bride and groom lifted up on chairs dancing the night away. 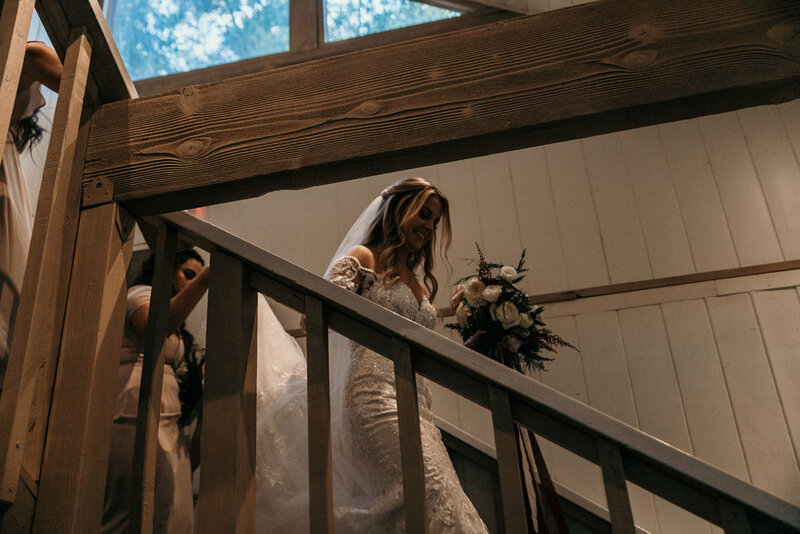 Sierra and Griffin celebrated their wedding at Calamigos Ranch in front of their family and friends; saying their I do’s under hanging lights, and an incredible waterfall backdrop. We are so happy we were able to be a part of their wedding day and being able to document such an amazing day in their lives. Here is a look at how the day unfolded. A: Once I knew I was going to have a December wedding, I immediately began to dream of a long-sleeved wedding gown. 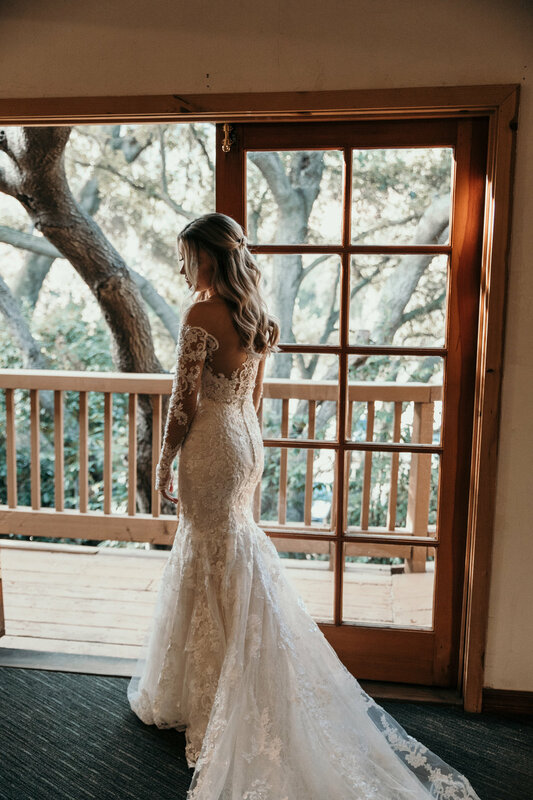 I would say my wedding dress style was traditional romantic with lots and lots of lace. The girls at Blush Bridal here in Tustin were amazing and really did help me find the gown of my dreams! Griffin had only one request when we started the wedding planning, he wanted to wear a navy suit! So navy it was. 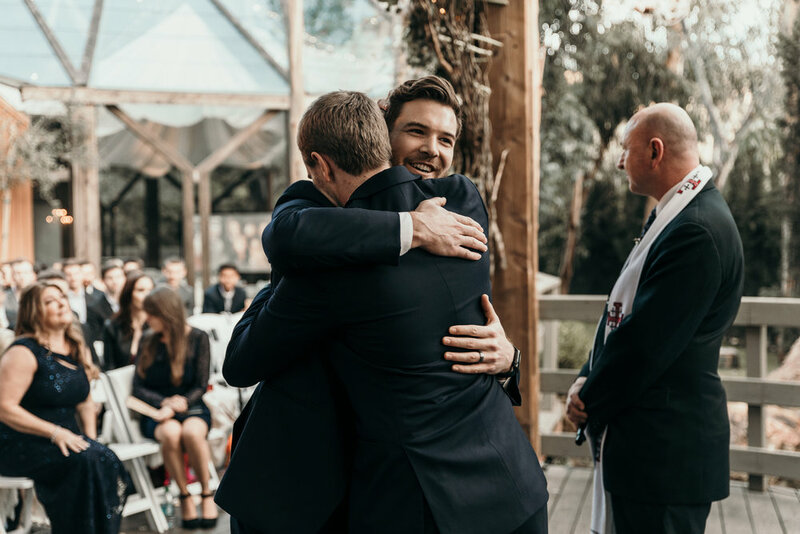 We were really happy with the quality and affordability of the suits from menswear-house and all of the groomsmen seemed to agree! A: Where do I even begin?! Well for starters, a lot of the inspiration for the big day came from the date that we had decided on. I always knew that I wanted either a fall or winter wedding, so we decided on December 22nd! With this date only being a few days before Christmas, I knew I had to incorporate lots of greenery and dark burgundy colors. I wanted a winter color palette that complemented the quickly approaching holiday without being "too Christmassy". During our ceremony, we chose to do lighting of the unity candle to symbolize our two lives becoming one. Our mothers came up to light our individual candles, which was something really special, and then we took our individual candles to light the unity candle that engraved on the side of it said, "This day I will marry my friend, the one I laugh with, live for, dream with, and love". 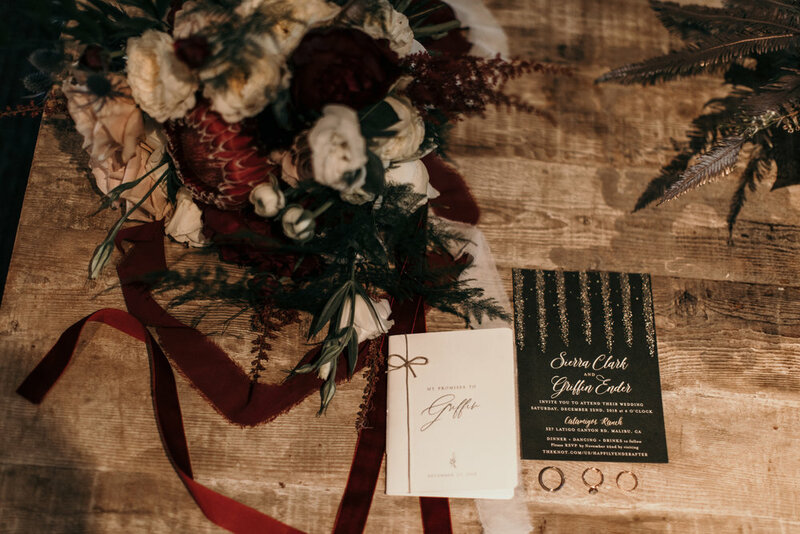 A: One of my goals throughout the wedding planning process was to make this wedding a reflection of who we are, so I made sure to add a personal touch whenever possible. For starters, the whole ceremony was created by Griffin and I, with the help of our amazing officiant, Roche. We topped this off by writing our own vows to each other, in booklets that I had personalized for us. In addition, we made sure to have one of our most important family members, Griffin's Labrador retriever Mike, walk down the aisle and stand by our side. He's been there throughout our entire seven-year relationship and it just didn't feel right to not have him there!Another one of my favorite elements, came once again, from my amazing dad! He set up a projector in the corner of the reception room that had a live feed of the photos that guests were posting from the wedding by using our hashtag. It was so fun to be able to see pictures of the ceremony moments later during dinner & dancing. Our guests had a lot of fun with this one. One of my favorite moments of the night had to be when we did our grand entrance! 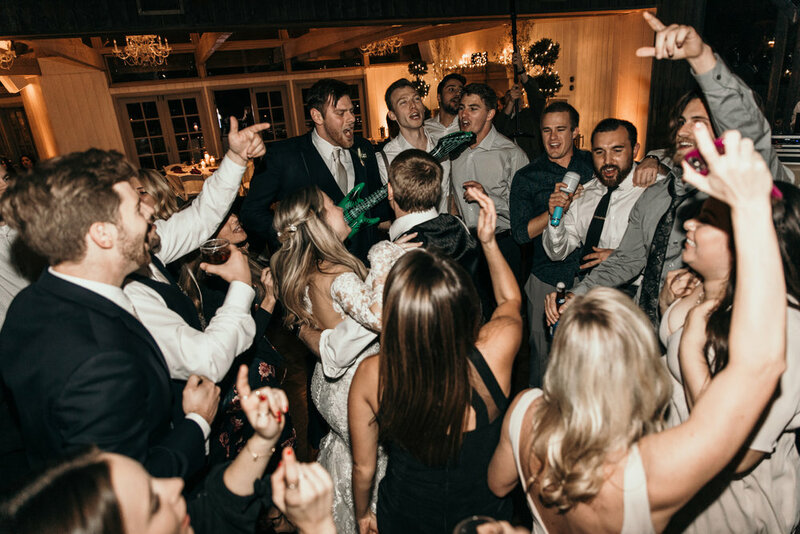 Griff & I decided (well mostly Griffin), that we wanted to give each couple a different song as well as an "NBA-Style" introduction with stats about each bridal party member. Our bridal party had no idea what was about to be said and that was the best part! 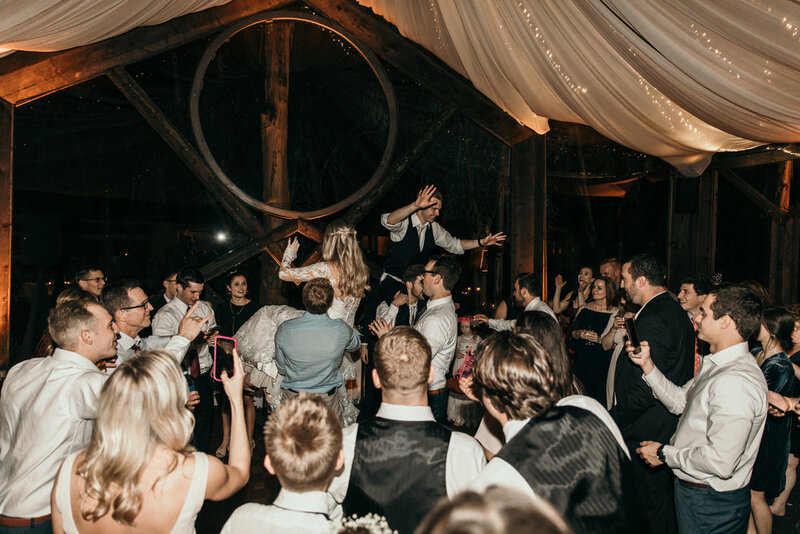 Shoutout here to our amazing DJ, Brendan, for being just as stoked about this as we were, and for not judging us when we said we wanted to enter the reception to the Jurrasic Park theme song. Finally, in the spirit of not taking ourselves too seriously, my dad and I decided that we wanted to mix things up a bit for our father-daughter dance. We started off dancing to a beautiful ballad that was edited to eventually sound like the DJ equipment was malfunctioning and skipping. Using our incredible acting skills, my dad and I pretended to not know what was happening. Brendan, our DJ, also used his incredible acting skills to pretend like he was trying to fix the problem. I then made my way to the DJ stand where my bridesmaids handed me a blowup guitar and sunglasses that were hiding under the table. The song then changed to a classic 70's rock song and all the sudden my father had a microphone and we were jamming out to a very relieved wedding crowd. Moments later the bridal party joined us with their matching guitars and after that, the dancing never stopped! A: For me, the most anticipated moment of the day was the ceremony. 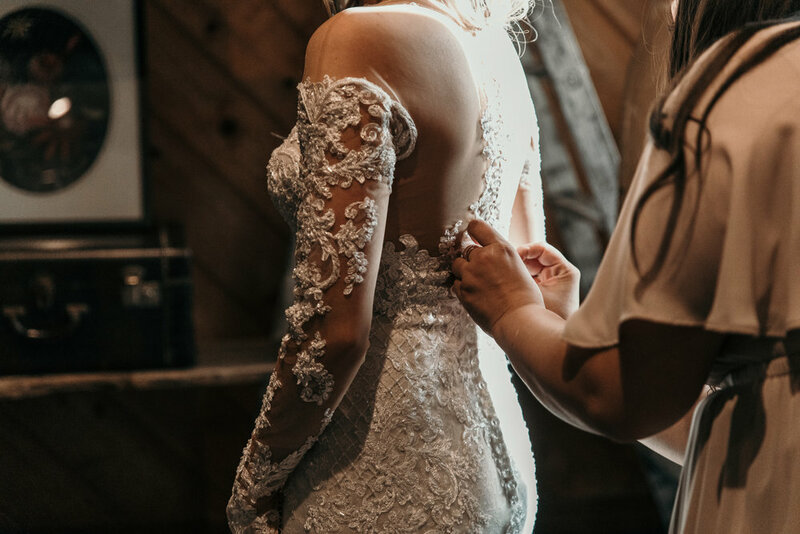 Even though we had already done the first look, I was still full of butterflies the moments leading up to the processional. The doors opened and I heard the music to one of the most beautiful songs ever written, "Carry you" by Novo Amor. Then, in front of the people who mean the most to us, we became one. Now I am Mrs. Ender and it is one of the greatest honors of my life! A: Oh gosh, this feels like a million years ago! Griffin and I actually met in high school when we were fifteen. To give you some perspective we are twenty-four now. We met in sophomore English class and the rest is kind of history! Ah, the proposal. One of my favorite parts about telling this story is sharing how many times I almost found out about it! So basically, Griffin had told me a few weeks prior that on Saturday, February the third, we were going to attend his bosses surprise birthday party. Tuesday of that week I was looking for something in his nightstand drawer when I come across a card from Tiffany's with a bunch of handwritten info on the back including my ring size, and specifications about what sounded like my perfect ring. I proceed to call my best friend, who already knew about the proposal, to tell her what I had found. She does a great job at keeping her cool and we collectively decide that he is probably going to do it on my birthday trip to Malibu which isn't until March. Then on Friday, I get a group text from one of my friends saying she can't wait to see us this weekend and wants to know the address of the house we are staying at. My soon to be sister-in-law responds to the message informing Grace that I won't be going with them this weekend cause Griffin & I have other plans (bosses surprise party). Saturday comes around and I have conveniently made a hair appt that morning (go me!). I get home and change for the party and we begin our drive to Corona Del Mar beach. We park and walk down to Inspiration Point right at sunset and it is STUNNING. One of the most beautiful sunsets I've seen to date actually. Griffin then looks at me to tell me that there was, in fact, a party, but it wasn't for his boss. He then gets down on one knee to ask me the question I've been waiting for years to hear. All of the sudden our best friends and roommates show up (incognito) with a camera to take pictures of this special moment. He then proceeded to tell me that there was a group of our friends waiting for us at a restaurant on the water in Newport Beach where we had a celebratory dinner planned in a private room. In addition, he rented a beach house for the weekend where all of our friends and family would come the next day to have an engagement party and celebrate with us. It was the perfect weekend and I am seriously so blessed!